2010 marked the first time the majority of the world’s population was living in urban areas (52%), up from 47% in 2000. The global share of population living in urban areas is projected to increase to two-thirds by 2050. In 1990, the nation’s population was heavily urban (78%). By 2010, more than four of every five U.S. residents was living in an urban area. In some states, such as California (95%) and New Jersey (94.7%), nearly all of the state’s population resides in urban areas. North Carolina has a significantly smaller share of its population living in urban areas than the national average, but has increasingly urbanized over the past two decades. 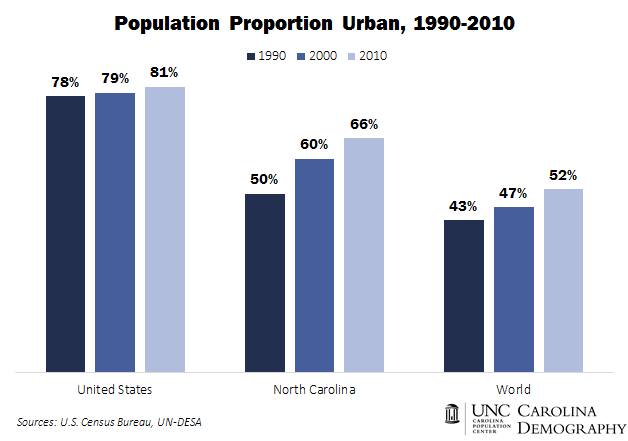 In 2010, two of every three North Carolina residents was living in an urban area, up from 60% in 2000. Among North Carolina’s 100 counties, only 8 are as urbanized (or more) as the nation. 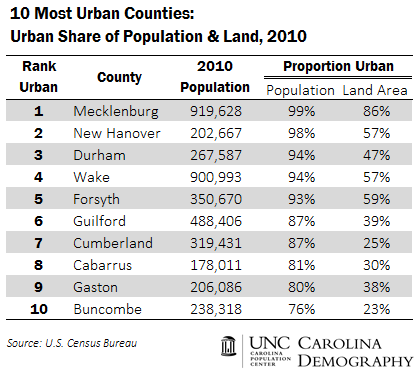 Mecklenburg is the most urbanized county: 99% of Mecklenburg’s population lives in an urban area and 86% of the land area was classified as urban in 2010. Among the other 10 most urban counties in the state, only New Hanover, Wake, and Forsyth have more than half of their land area classified as urban. In 2010, North Carolina had the second largest rural population (3.2 million) after Texas (3.8 million). Fourteen counties in the state have no urban areas at all. They contained 191,000 residents—2% of the state’s population—in 2010. Nationwide, there are 486 urbanized areas and 3,087 urban clusters. The population classified as urban includes all individuals living in urbanized areas and urban clusters. This entry was posted in Carolina Demographics and tagged rural, trends, urban, urbanization. Bookmark the permalink.